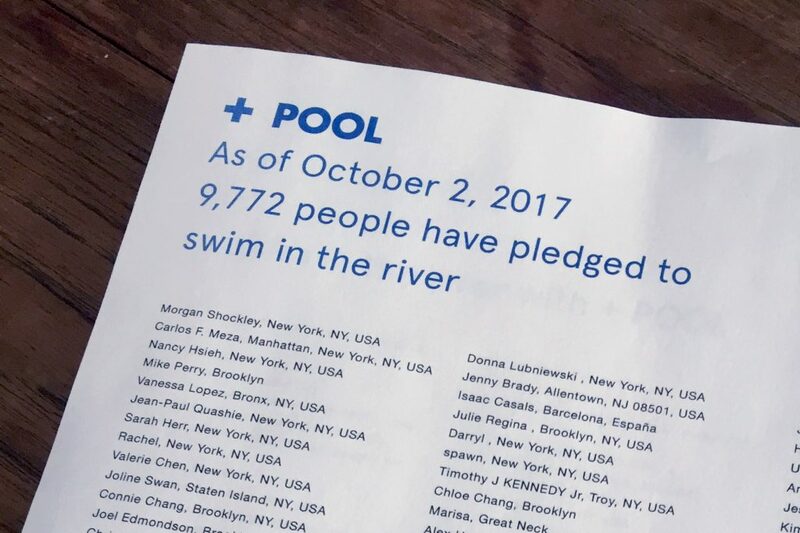 Over the summer of 2017, we launched an online petition to show the City of New York just how many people want to swim in the river with + POOL. Within a few months, nearly 10,000 people from all over the world had made their pledge. In October 2017, we sent a letter to Mayor Bill De Blasio inviting him to join the unbelievable list of supporters that want to swim in the river, along with every name from swimintheriver.com in a stack nearly 100 pages thick. We’ve been speaking with the Mayor’s office for some time now about all the technical developments we’ve made with + POOL, but it’s super important for City Hall to know how many people are behind the effort to make it happen. The petition is still going strong, and if we happen to reach 100,000 signatures (a cool 1% of the population of the city of New York), then Heineken will donate $100,000 to + POOL. Pretty cool.